The growth in inbound student numbers that Japan began to show in 2014 has continued through 2016. 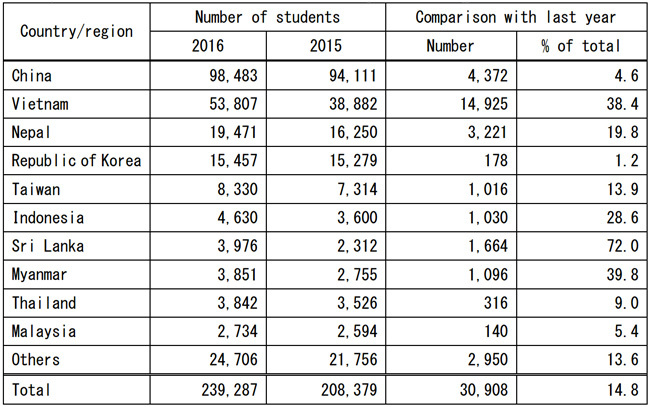 Every year, the Japan Student Services Organization (JASSO) offers a snapshot of foreign enrolment in the country (as of 1 May each year) and the latest numbers indicate just under 240,000 students for 2016. This amounts to year-over-year growth of 14.8% and an overall increase of nearly 30% since 2013. Speaking to The Japan Times, an education ministry official credited the growth to expanded commercial ties between Japanese corporations and key sending markets, as well as increased promotion of study in Japan by local agents abroad. These recent-year gains put the country on track to reach its long-standing goal to host 300,000 students by 2020. That target certainly seemed out of reach until about 2014, but growth since then has been fuelled by a more active recruiting effort on the part of Japanese institutions and by other recent measures to boost the employability of foreign graduates. As we noted recently, along with its overarching enrolment target, Japan also aims to raise the employment rate for its international graduates to 50% (from the current 30% rate) by 2020. In support of that employment target, the Japanese government is offering new incentives to both graduates and employers, including subsidised company internships, help with finding jobs on graduation, additional Japanese language courses, and more streamlined processes for work visas. For 2016, total enrolment breaks down into roughly 70% (171,000) of students enrolled in higher education and 30% in language schools. 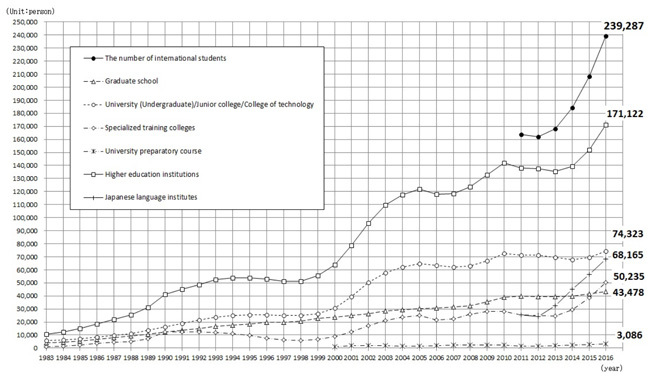 As in previous years, Japan continues to draw almost its entire foreign student population from other markets in Asia. In fact, 90% of all students come from the top ten sending markets, all of which are within the region. As the preceding table reflects, China remains the clear leader among sending markets for Japan. But Vietnam has been the big story in recent years, and was again in 2016 as the fastest-growing market with a very noticeable 38% growth from 2015. In fact, Vietnam accounted for nearly half of total growth in 2016 all by itself. Other notable gainers on the year included Nepal, the third-largest source market with a 20% increase, Indonesia (29%), and Sri Lanka (72%). This entry was posted in Asia, Japan, Regions and tagged international students, colleges with international students, student mobility, student recruitment, student enrolment.